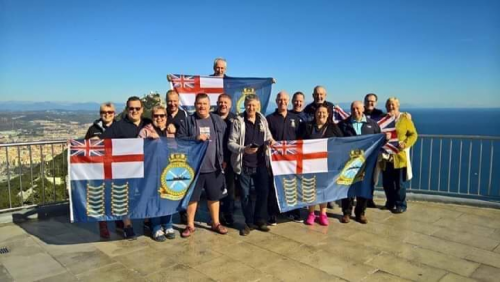 A delegation from the Type 42 Association from the UK visited the historic naval base of Gibraltar over the weekend. The association, which welcomes those who have served on a type 42 navy Destroyer ship, visited The Clipper in Irish Town for a meal, and had drinks in the Lord Nelson and the Star Bar. The majority of the group had been to Gibraltar before while serving in the navy, and visiting the Rock brought back memories. For one couple on the trip, this weekend marked 48 years to the day they had their honeymoon in Gibraltar. Member Albert Neal and Fiona Neal, of Romford, east London, celebrated their 48th wedding anniversary while visiting the Rock. Mr Neal, who turns 70 in May, joined the navy as a radar plotter and rose to become a petty officer. Fiona Sutherland, originally from Dunfermline, Scotland, joined the Womens’ Auxiliary Air Force as a chef. They met as part of a pen pal scheme and celebrated their honeymoon in Both Worlds in Gibraltar 48 years ago to the weekend. They married with Albert aged 21 and Fiona aged 19. They have two daughters and four grandchildren, and will become great-grandparents next month. Nearly 50 years on, they visited again for the weekend with the Type 42 Association. *The association costs £12 to join per year per member, which includes access to an online forum where other type 42’ers can talk, as well as arrange socials and meet-ups. For more details on the Type 42 Association, visit www.type 42association.co.uk.